was born with the highly auspicious 'treasure-hair' growing on his brow. This is one of the thirty-two marks of an enlightened being and was noted on the young Shakyamuni. He grew up receiving a very thorough education from famous scholars and eventually received the Kagyu transmission from Jamgon Kongtrul Lodro Thaye, who also passed on to him the essence of his hundred compositions embracing the profound teachings of all Tibetan Buddhist traditions, as well as the domains of medicine, art, linguistics and general Buddhist studies. 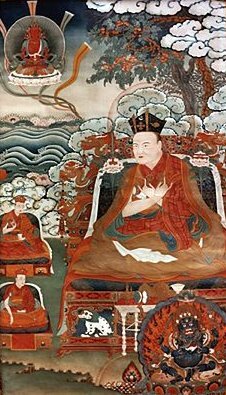 Khachap Dorje's life was a brilliant example of the bodhisattva with an insatiable desire for learning in order to help other beings. Some years before his passing, he entrusted a prediction letter to his closest attendant.